Foodie PenPal day is one of my favorite days of the month. A surprise package full of yummy goodies. This month my package was from Julie in Arizona. Lots of snacks, tight up my alley . The pita chips were a hit in my house. I think I am going to make a Chobani Feta dip to go with the Rosemary flavor. 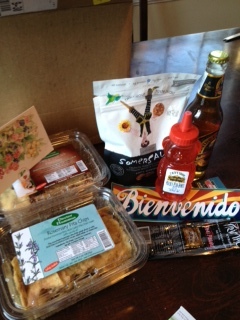 Thanks Julie for all of the goodies. Love the package you sent to Lindsay; that peanut butter intrigues me 🙂 Thanks for sharing your treats with all of us!